Club Penguin Cheats by Mimo777 Club Penguin Cheats by Mimo777: Club Penguin Reviewed By You: Igloo Items! There are many things that I do to stay healthy. I practice karate. I love to dance. I also attend camps during my summer vacation. The camps I did were soccer and fencing. I even did a robotics camp to keep my brain healthy too. But two of my favorite things I do to stay healthy are my mom makes me and my family healthy meals and I love to play outside with my friends. Anyways.... 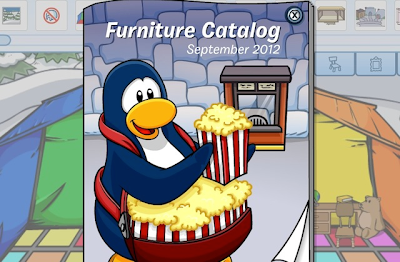 The new Furniture Catalog is out now. So for this Reviewed By You, CP would love to hear what igloo items you'd like to see in a future catalog! They'll pick one of our favorite comments to be featured in our next Reviewed By You. The lucky penguin will also receive 10,000 bonus coins in their account! We would like more girl headgear in EPF, most of it you have to look like a boy to make it work. Same with the musical instruments in the lighthouse, everyone has look like a boy to make it work. Face item of large girly eyelashes. Clothes washers and driers, I want to make a laundromat. a kitchen table or square table that has salads or fish on it. a dish like the candy dish that has a salad. a thing like the single flare (or the flashing flare) that squirts up water instead of blue flame. rugs and wall decorations with bright flowers on them. a floor that's metal for Bobby's space control room. A big tree like the community garden one that we can make turn fall colors. vines for the walls that have fruits and flowers on them. a tree that you can change the fruit from apples, oranges or pears. dirt, water and grass floors. I would like a smaller igloo that could go on different backgrounds and you could still decorate the rest of the space.